Marvin Gaye - M. P. G.
"It Takes Two" was a hit single recorded in late 1965 by Marvin Gaye and Kim Weston for Motown's Tamla label. 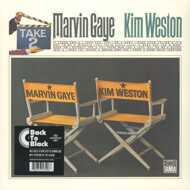 Produced by Weston's then-husband, longtime Gaye collaborator William "Mickey" Stevenson, and co-written by Stevenson and Sylvia Moy, "It Takes Two" centered around a romantic lyric which depicted many things in life (dreams, love, wishes, etc.) being better with two people instead of one. The single became Gaye's most successful duet single to date, later outperformed by Gaye's duets with Tammi Terrell. Also in 1967, soul singers Otis Redding and Carla Thomas covered the song for their duet album, King & Queen.